I'm looking for information and photographs of the old Pitcairn Fields to include on this page. If you have some you'd like to share, please click this FORM to contact me. You have chosen to enter the suite via Pitcairn Field. Spend some time here by clicking any or all of the navigation buttons at the top and right of any page. When you are finished, you may come back here by clicking HOME and direct your browser to the other sites tabulated, summarized and linked from the travel hub table below. In aggregate, these Registers recorded flight activity around the United States from 1925 to 1942. Pitcairn Field has an extraordinary history. It was founded by Harold Pitcairn, one of the fundamental movers and cornerstones of Golden Age aviation. His airfield actually occupied two sites through its life. It became an official airport entity ca. 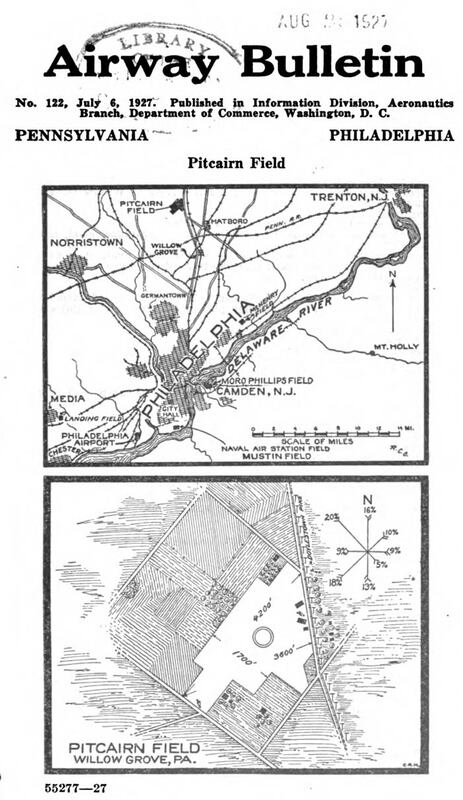 1916 at a site in Bryn Athyn, PA (see airport diagram farther below). The second site, at Willow Grove, PA (diagram, farther below), was established ca. 1926. A wonderful summary of both locations of Pitcairn Field is downloadable (PDF 600Kb) at the link. It includes photographs and diagrams. This summary is abridged from the Abandoned & Little-Known Airfields Web site operated by Paul Freeman. The first site was small, but active. It offered flight training, air shows and pleasure flights as commemorated by the certificate at right, shared with us courtesy of David Pitcairn. An example of an air meet held at the old field is pictured below. 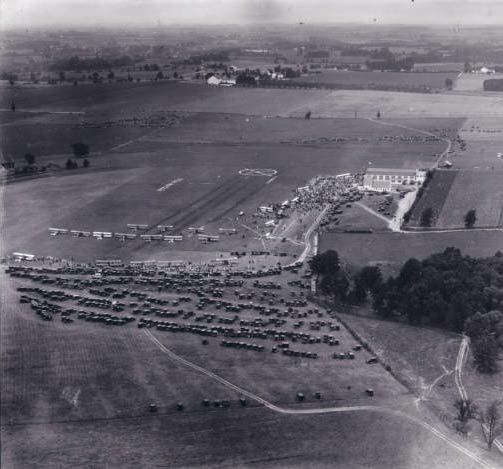 The photograph from the Hagley Museum and Library, Wilimington, DE, shows at least two dozen aircraft on the ground, ca. 1925. 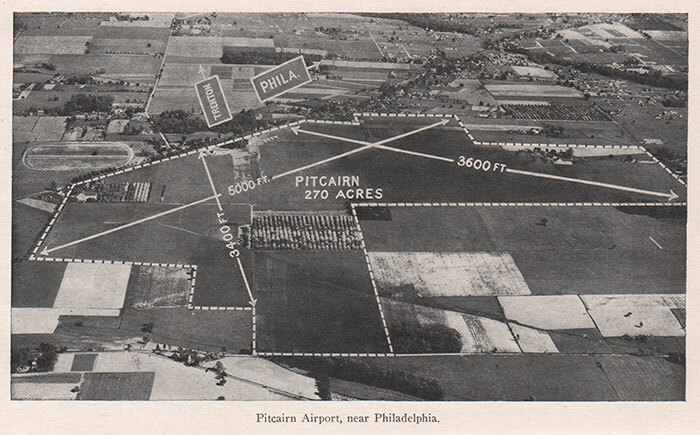 The second airfield site, representing a move to a larger area, resulted from the need to accomodate expanding flight instruction, sightseeing flights, air mail operations and aircraft manufacturing (some manufacturing operations remained at Bryn Athyn). 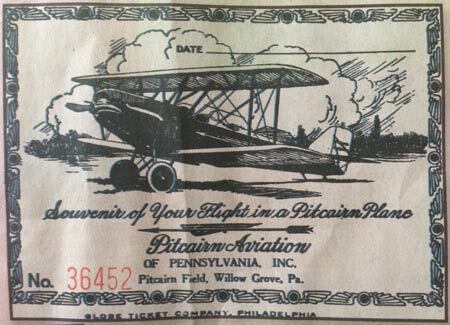 The Aircraft Yearbook for 1926 gives a sense of the newness of the Willow Grove site, "... Harold F. Pitcairn, president of Pitcairn Aviation, Inc., is a pilot, and also a director of National Air Transport, Inc. 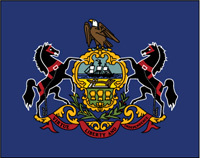 The Pitcairn Field is at Willow Grove, Pa. Here are a factory, hangars and ten airplanes. During the first sixteen months of operation by Pitcairn Aviation, Inc., no passenger has suffered the slightest discomfort. In 1925, Mr. Pitcairn's ships made 5,314 flights, covered 63,000 miles and carried 4,168 passengers." Below, an aerial photograph of the Pitcairn manufacturing facility at Willow Grove a few years later, ca. 1930. An autogiro sits in the upper right corner of this photograph. This REFERENCE provides a biography of Harold Pitcairn and documents the history of his aviation businesses. 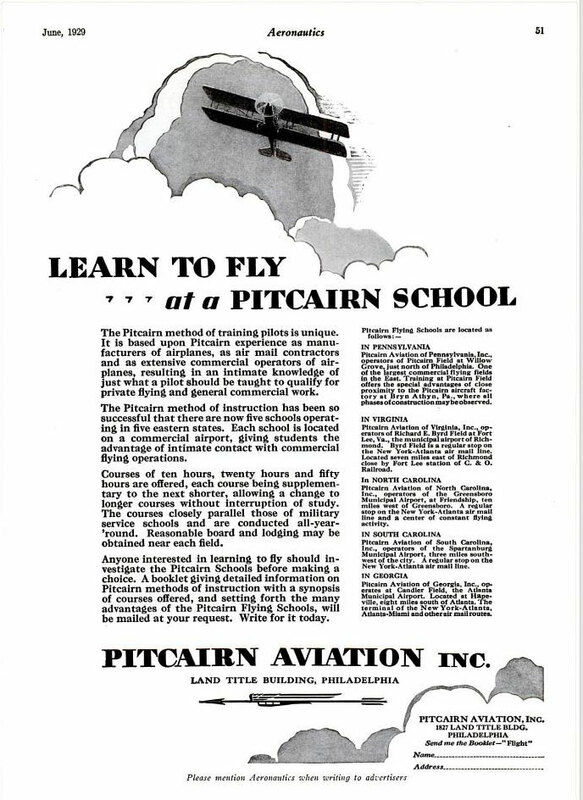 The Pitcairn flying school operation at Willow Grove was advertised in aviation publications of the era. An example from Aeronautics magazine from June,1929 is below (note that other training centers were distributed up and down the east coast). Map, left, courtesy of R.E.G. Davies, shows the route of Pitcairn's Contract Air Mail (CAM) franchise. 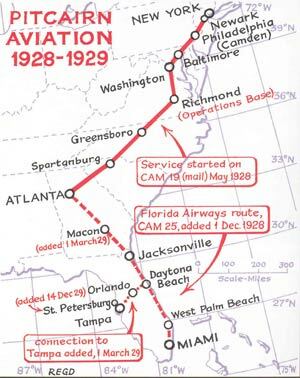 He operated New York to Atlanta (CAM-19), and later Miami to Atlanta (CAM-25). These routes were sold by Pitcairn to North American Aviation on July 10, 1929 and renamed Eastern Air Transport on Jan. 17, 1930. Eastern Air Transport eventually became Eastern Airlines. Without the airmail routes, Harold Pitcairn was free to concentrate on production of his Pitcairn Mailwing biplane, which he had developed to fly the mail. But it was so popular among other pilots there was a lucrative business in their manufacture. Likewise, through another business partnership in 1928, Pitcairn began rotary-wing aircraft production in the form of the series of autogiros which, along with the Mailwing, assured the Pitcairn name a place in Golden Age aviation history. In 1942 Pitcairn sold his Willow Grove airfield to the United States Navy to support their efforts during WWII. And thus the Register was closed January 25, 1942. Please note, while Pitcairn Field operated at two locations from ca. 1916 to ca. 1942, the dates you see in the banner above are the dates that the known REGISTER was kept open at Willow Grove. Click the REGISTER button at top right to learn more. WHAT IS THE PITCAIRN FIELD REGISTER? The Pitcairn Field Register was an approximately 13.75” L x 10.5” W, case-bound, leather-covered book. The book lay open from October 22, 1927 to January 25, 1942; a total of 5,240 days. It is unknown if there were additional books before or after these dates. If you know of other repositories for Pitcairn Field Register pages or traffic information, please let me KNOW. You may view each of its pages by clicking the REGISTER button at upper right. The Pitcairn Register was ruled into rows and columns with headers across a single page that specified the information to be entered. It was not a book specially designed as an airfield register. The book could have occupied a hotel lobby desk, for example. Beginning with page 15, someone (now lost to history) began defining more clearly the information that should be entered by pilots. They doubled the width of the area for entering information across two facing pages and penciled in the categories of information to include. 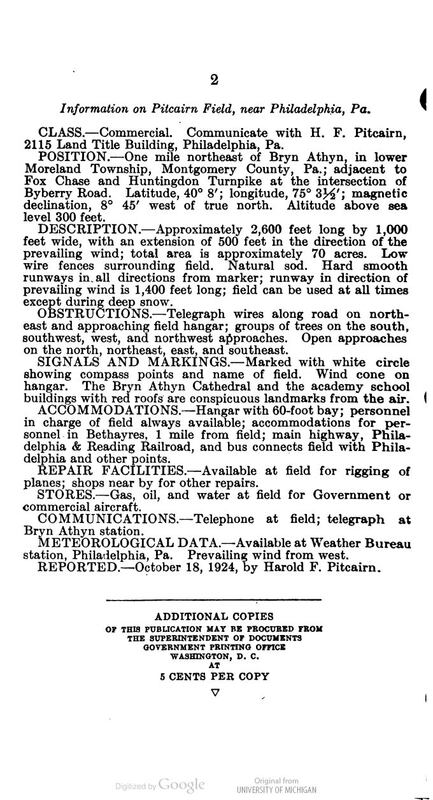 Below, an image of part of the top half of page four with data for June, 1928 through February, 1929. This was before two facing pages were used. The Pitcairn Register records 328 landings over 21 pages. 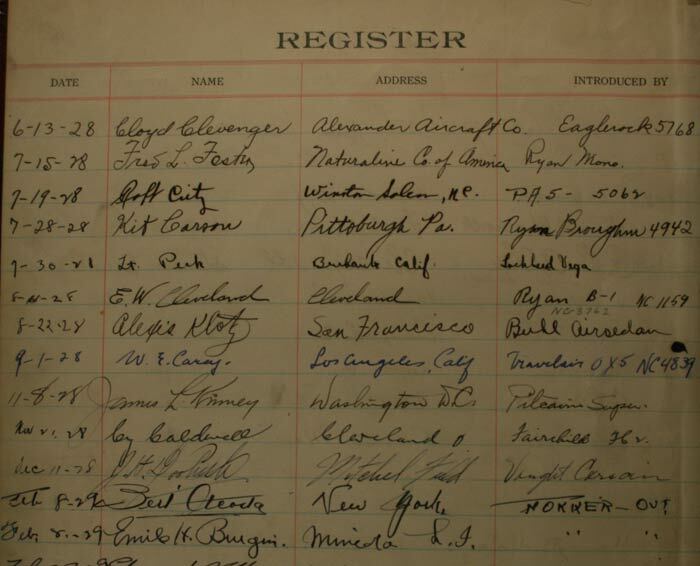 Compared to other Registers of the Delta Mike Airfield, Inc. suite, the Pitcairn Register was open the longest for pilots to sign (5,240 days), but it recorded the fewest landings (328). I have no explanation for this. Your Webmaster's copy of the Pitcairn Field Register was photographed by me at Bryn Athyn, PA on October 20, 2010. Thanks to the hospitality of David Pitcairn and staff for arranging permission to review and copy the Register, as well as many other Pitcairn artifacts that are integrated into this Web site. WHAT WAS PITCAIRN FIELD? 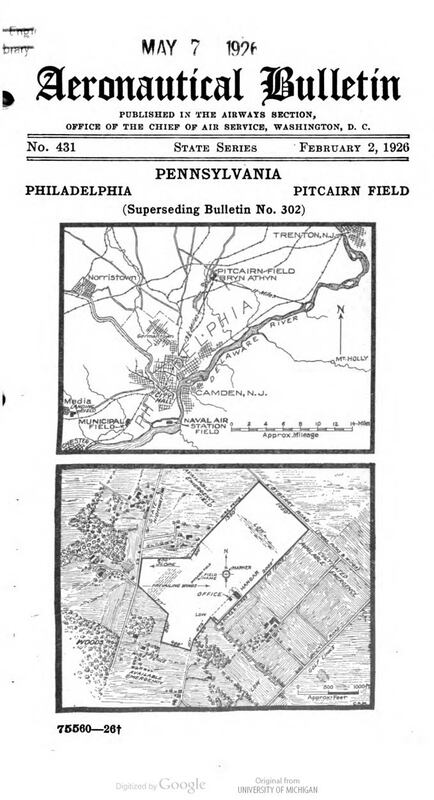 As mentioned above, Pitcairn Field occupied two locations. Below, the February 2, 1926 airport diagram from the Aeronautical Bulletin, published by the "Airway Section of the Office of the Chief of Air Service," depicts and describes the Bryn Athyn location. The next page is a physical description of the field. Note that the information was reported two years earlier by Harold Pitcairn. 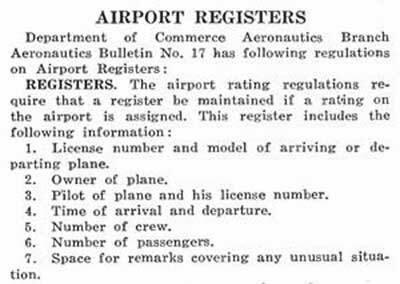 Notably, lots of reorganization occurred around the managment and regulation of aeronautics at the federal level in the United States beginning in 1926. The promulgation of the Air Commerce Act and the formation of the Department of Commerce (DOC) Aeronautical Division resulted in rules for establishing pilot competence, aircraft airworthiness and airport and airway specifications. Pitcairn Field was moved to its new Willow Grove location concurrent with these changes. For this Web site, which celebrates the Register from the second location, we focus on that field, below. The aerial photograph is from the Aircraft Yearbook, 1926, page 68. Compare this aerial view with the diagram below from the Airway Bulletin, published now by the DOC on July 7, 1927. 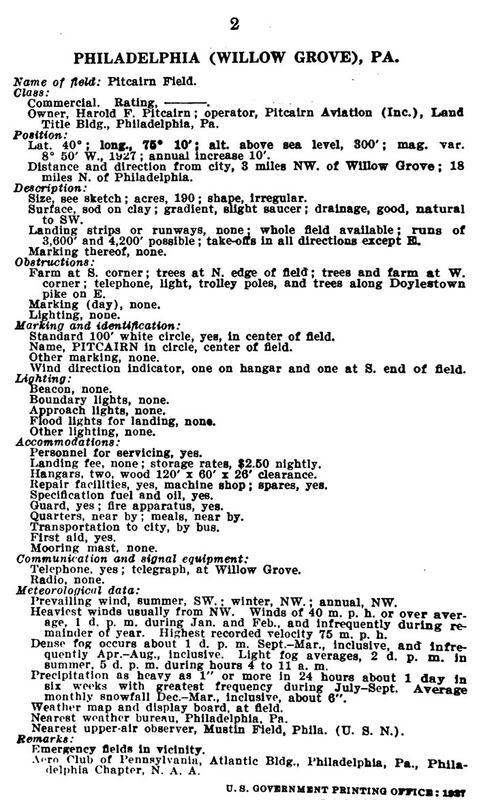 The description defines the Field about a year after the move from Bryn Athyn began. The interesting "wind rose" in the lower panel of the image above denotes the percentage of the time and the direction that wind can be expected at the field. Wind roses became a common image on charts of the time. WHY BE INTERESTED IN MUSTY, OLD BOOKS? Each Register is a microcosm of Golden Age aviation history, recorded in the first-person, usually by the very actors who made that history. Study of Golden Age people in aviation points to an aerial “lifeway,” including shared values, clothing styles, politics, interests, vocabulary and perhaps even diets and social skills. Being a pilot in those early days was like belonging to an adventure-based brotherhood. But, men did not have a lock on camaraderie. The female pilots, although there weren’t as many of them, shared an equivalent sisterhood that, in many ways, was just a powerful as their male counterparts. Whereas the Web is infinitely wide, it is many times only a few centimeters deep. Each Register, and their associated Web sites, gives us an opportunity to dive into a deep, virtual pool of information to enjoy meeting the characters and hardware that shaped aeronautical science across the United States through the 20th and into the 21st century. Their influence is palpable today, and will be tomorrow, as we go to the planets and beyond. All Web pages are designed by your Webmaster and implemented by The Web Professional, Inc., Naples, FL & St. Paul, MN. All Web sites are wholly owned, researched, written and operated by Delta Mike Airfield, Inc., a 501(c)3 non-profit education company based in Naples, FL. Unless otherwise noted, all designs and original texts and images are Copyright © Delta Mike Airfield, Inc. The mission of the company is education, encouragement and support of historical aviation research and multi-media publication to enhance knowledge among public and private sectors around the globe. Specific emphasis is on the Golden Age of Flight, nominally between 1920 and 1940. The company operates primarily, but not exclusively, through its Web sites. Other mixed media publications and public appearances also support the Company. Your donations can be made through any of the Web sites.